This midweight base layer is made for cool conditions and is also perfect for high-intensity cold-weather rides where wicking moisture from your skin is a priority. The clever Hydrophilic Prosecco fabric spreads moisture out over a larger area for rapid evaporation. Featuring two different weights of fabric, with the lighter weight fabric included where your shorts or tights cover you, Castelli have cleverly given you less insulation where you don’t need it. I did not feel cold even in the winter early morning ride. Comfortable and warm enough down to about 5 degrees with something like the Alpha Ros Jacket. Doesnt feel wet/damp when I work up a sweat. Im 170cm and 70kg and small fits perfectly. 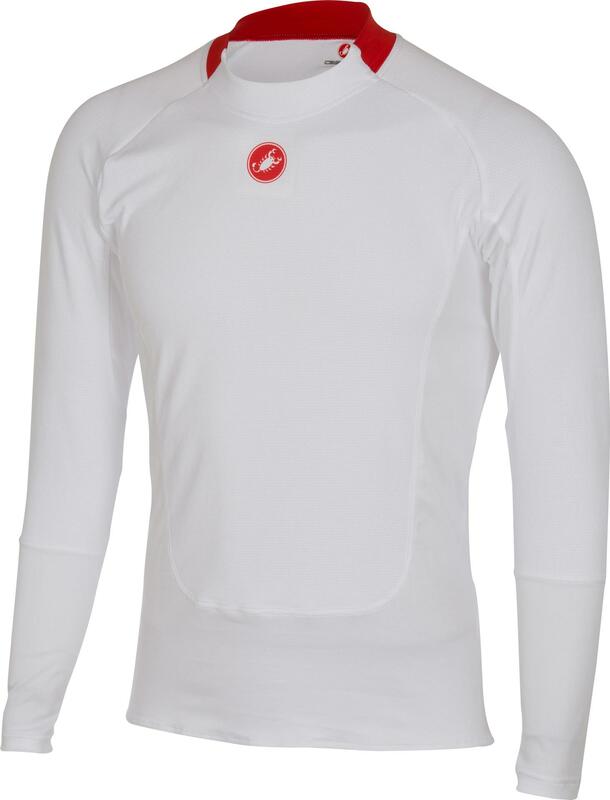 I never find I have to size up with Castelli but prefer a snug fit and thats exactly what you need with a base layer. Merlín offered the best deal around. Delivery was quick as promised despite the Christmas period. Excellent product - especially at sale price. Very comfy to wear - I take x-large in Castelli but large in this base layer was perfect. Excellent wicking and goes through washing machine easy. Base layer provides warmth on chilly days without bulk. Fits like glove and easily worn under standard jerseys or tops. Lightweight makes for easy packing too. I use mine for cutting chill on cool/colder weather while cycling. This is a very well-made garment. It feels very comfortable and fits nicely under top layers. I am 40" chest and size Large was just right. Only slight negative is that the neck opening is not huge and if you had a very big neck then it might be too tight. Perfect base layer, fast wicking and warm ! Top class base layer! After years of trying others, I finally got around to getting a s/s and l/s Prosecco. Fabric feels so soft to the skin. Wicking is superb. Looks good too with the red highlight to collar. Size-wise I didnt do the usual size up 1 size as a base layer should be tight fitting. Unlike most of Castelli's jerseys and jackets which I have to buy in XL, this one in L is a comfortable slim fit. I'm 5'10", 39 inch chest and 36 inch waist. Feels nice & toasty, lightweight & fit is great. Not much to say about these quality bits of clothing - warm enough, snug fit and good wicking. Like them a lot. Great base layer the best I have tried, must have ten or more that do not do as it says on the tin.